Alt Appreciation – Warrior Week! This is the final installment of Lae’s alt appreciation weeks. I’ll be sad to see this challenge go. Re-visiting old memories, chatting about our characters and playing with transmogs. This last week, for us, ends on a “meh” toon unfortunately – Warriors. Warriors, for me, are a no-go. 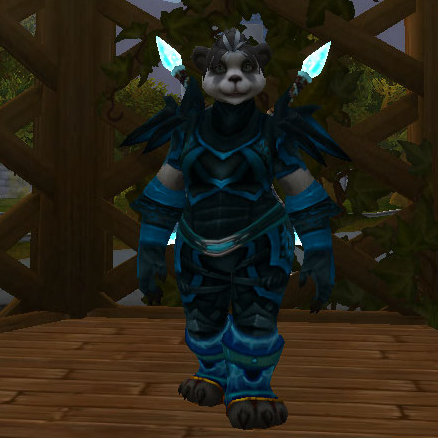 I tried to level one and the only bit I liked about it was that she was a Panda. She got to level 21 and I deleted her… I really didn’t enjoy it. I can’t pinpoint why exactly, perhaps I’ll try again in a few months, but for now… I’ll be warrior-less. As a contrast, I love my warrior! I levelled him really quickly and loved every minute. I think it’s bashing bad guys over the head with an axe that is really satisfying and the glyph which leaves a trail of fire behind when you charge? Awesome! 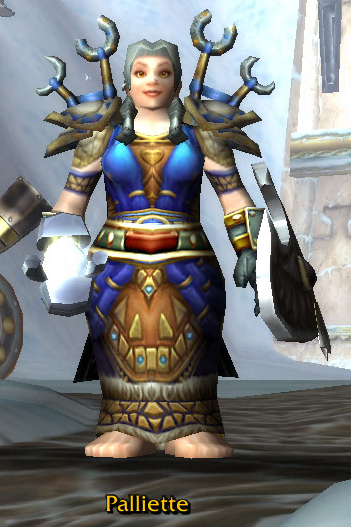 I also really love the mog sets available, I’ll post about this one later in the week. The only reason I really stopped playing it recently is because before the timeless isle went live, I got a bit stuck with gearing him up. He sits in PvP blues and hasn’t been played for a while unfortunately as I got bored with the slow gear drops. This, of course, meant I went and rolled another character – my hunter – for which I am eternally grateful. If you don’t have a warrior already… GO ROLL ONE! They’re really fun! Alt Appreciation – Warlock week! Warlocks this week. Both of us have unplayed warlocks at 90. Here’s our story. It’s fair to say that I go through phases with this toon. I played it a few months ago solidly, gearing it up and attempting that damn green fire challenge over and over and over…. and over. I used to really enjoy the warlock, but after failing on the green fire quest for weeks at a time, I got a bit bored and haven’t really been back since. I play as Destruction, but since they changed the moving whilst casting talent, I haven’t really been into picking it up again. I think it’s a real shame Blizzard decided to change it, I loved setting things on fire and the warlock kiting was awesome. 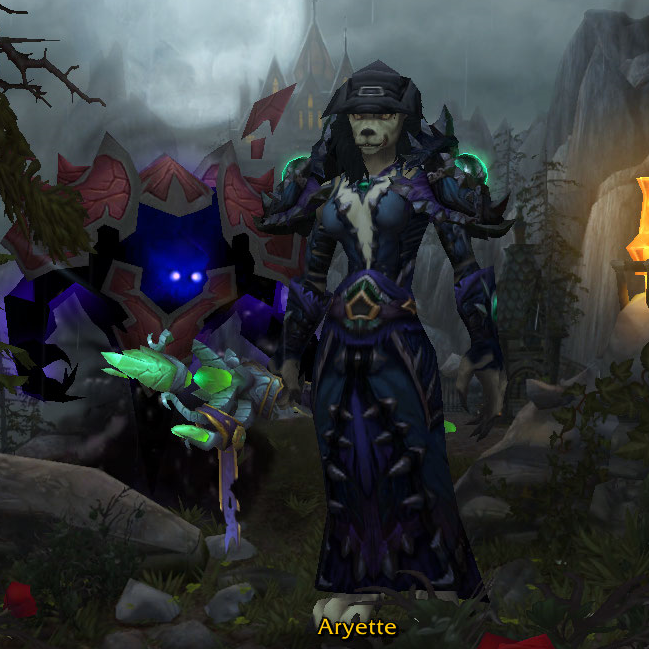 I also really love this mog from the picture. It took me a while to grind, but I think it looks very dark and warlock-y! Isn’t she cute?! She’s my only worgen and I love her name so much. I loooooved the Gilneas starting zone, as it’s something I’ve only ever done twice (once when I was a complete noob), so it was fun to go back and experience it again and take my time through the quests. Have you ever just kicked back and looked at how damn beautiful it is? I levelled her as part of a levelling project with my dear husband, and I really enjoyed playing her all the way through to 90. With a tank dedicated to serving you, it’s always easier to KILL YOUR FOES, but I found warlock survivability better than even my hunter. 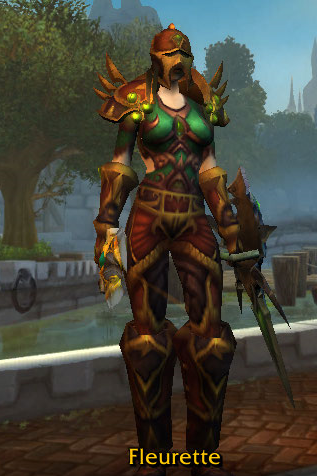 However, after dinging 90 and getting my transmog, I haven’t played her much. Unfortunately, dinging 90 tied in pretty much with the start of the 5.3 patch and I really didn’t have time to gear her up. She sat in HC blues for weeks, until I outfitted her in timeless isle epics and now sits around 490 ilvl. She’s always really fun to play, setting things on fire and burning them to the ground, but I find her extremely similar to my Mage, which I play as a main. There isn’t anything too enthralling about going from your main to something really similar… in my humble opinion anyway. I’d love to play her again, but I can’t see myself dedicating the time needed for a while… it’s good to know she’s there waiting for me though! See you next week for the last, but not least, installment for Warriors. 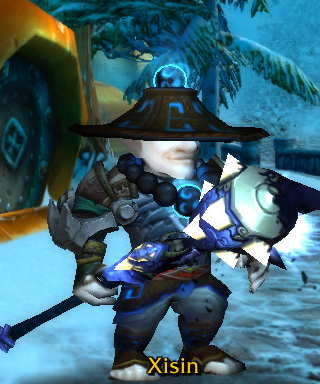 Alt Appreciation – Shaman Week! Welcome back to Alt Appreciation! This week is Shamans! We both have Shamans, but not an awful lot to say, so I’ll go first. My Shaman and I have had a bit of an on-off love affair for over a year. I rolled her as a pure healer – I have never DPS’d on her and levelled purely through instances. I wanted to do this for several reasons: learning the class, experimenting with those awesome totems and to not get side tracked by using awesome lightning to kill the bad guys. She’s my only Draenei and I’ve always found it hard to mog her, nothing seems quite refined enough for her! Poulette was interestingly, my first 90 in MoP. We were raiding at the time and I was healing (of course), so it was a priority to get her levelled up. However, I found it really tough, there were changes and new spells and CDs which I didn’t understand, so I quickly reverted back to my Mage as a main and raider. That said, now I’ve had some time to experiment, I do love this healer. I love using totems and I think they have lots of neat tricks up their sleeve. I know people really aren’t fans of the humble restoration shaman this expansion, but she still remains very close to my heart! My shaman is relatively new, I levelled him with Mrs B as part of a ‘couples project’ with her Monk. I love that he’s a Panda! I liked leveling my shaman especially through dungeons and spamming chain lightning. Of course, owning Mrs B on the DPS was always a bonus! Since I got it to 90 i haven’t been too enthralled with it. I get bored of healing very easily so have only tried that few times. With elemental spec, I found the rotation rather boring and dislike relying on procs for DPS. I have been thinking about trying enhancement but not too sure yet. As with anything, I suppose it’s time… and I’ve just started a new Horde DK that I’m desperate to level for some PvP pwnage! Maybe on day in the future I’ll get round to respeccing and finding some love for Burq. Alt Appreciation – Rogue Week! Rogues, the loveable creatures with a hint of mystery. I love her name, I wish I’d named my Monk that. This rogue originally started off as a project with Mr B and 2 other friends, where we were levelling together. I created her months ago, but only started playing her when we were levelling as a group. However, after a few days (around level 60), I was having some real issues understanding the class. Why did I spend half my time standing waiting for my energy to regenerate? Which damn opener do I use from stealth? At this point, I wasn’t much of an asset to the team, spending most of my time trying to get behind the stupid mob to get out of stealth. Let’s put it this way – I wasn’t a natural. Half the problem, I think, was that we were levelling so quickly that I wasn’t really having time to learn the class (who said levelling served no purpose?!) and I was getting frustrated. So, I swapped to my Warlock which worked much better. I’m not completely finished, but she has a lot of BiS gear now and I’m pretty pleased with it. Eventually I’d kind of like to try some PvP gear, but you all know how scared I am of those BG’s! I’ve been playing rogue in every expansion since vanilla. I have one alliance at max level which is one of my mains, and a horde at level 85. 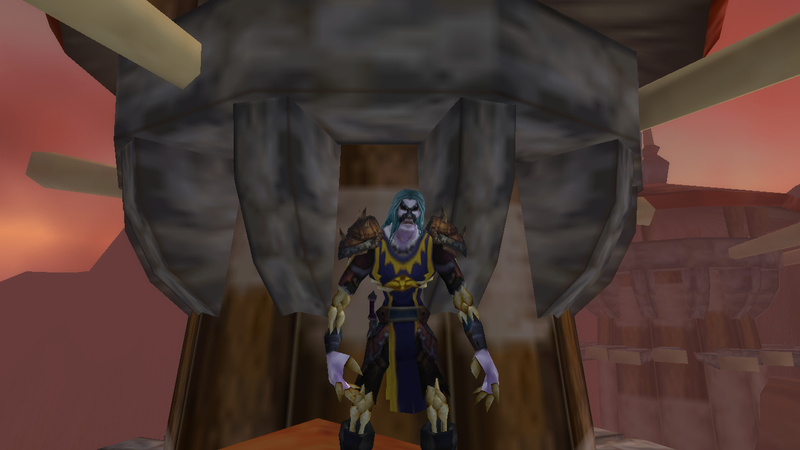 This rogue was my very first serious character back when I was a little newbie in 2005. It’s currently level 85 and very unloved with me not touching it since i dinged 85 back in Cata. I raided throughout vanilla on this but didn’t get that far into BWL. I had lots of fun PvPing and being part of an Assasin squad 😀 video below. This is rogue you know as my alter ego Mr WoW. I leveled it during Cata using the Scroll of Resurrection to level it to 80 when I returned after a break. 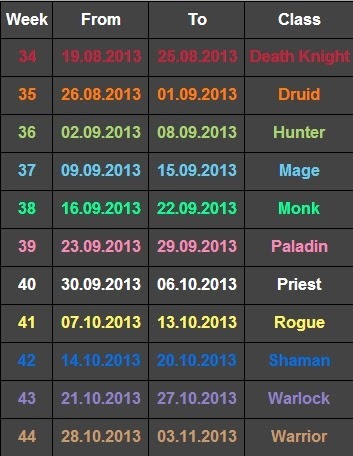 I dabble in playing it once or twice a week doing some dungeons or the dreaded LFR to try and keep up with his gear. I love being able to stealth and pop out the shadows to strike down my foe. My favourite spec is combat just because i like swinging my swords around, but I am thinking of trying to learn assassination if i get some daggers drop. My biggest grievance is that in nearly 9 years the class plays nearly the same as it did when we started. It would be nice to see some more differences between the specs and maybe a return of the old evasion tanking fun. That’s our Rogue alts done! See you next week. Alt Appreciation – Priest Week! Welcome back to Lae’s Alt Appreciation! This week, it’s the humble Priest. 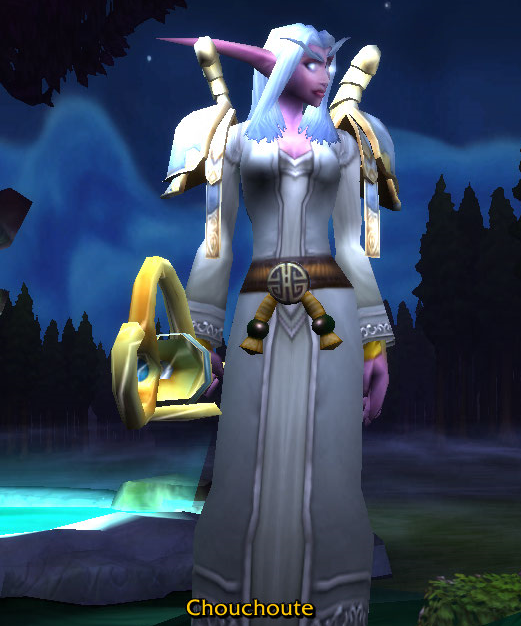 Anyway, my Priest is a NElf and is currently Holy with a Shadow offspec. I loved dotting and flaying and fearing as shadow, and I even – for once – enjoyed PvP as I found I was really quite survivable with the fears and silences. 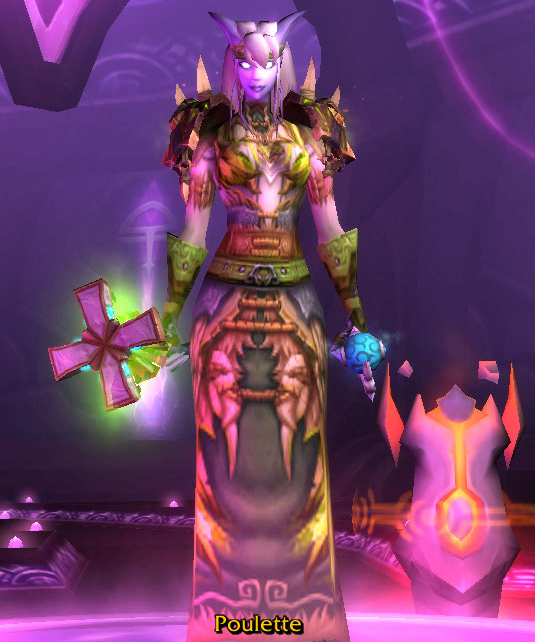 However, once I reached 90 I decided I really wanted another healer, and enjoyed Holy so much it’s stuck there since. My one and only Priest was my ‘main’ for a grand total of about a month. He is a worgen, specced Holy/Disc and my 3rd most well geared character. I do enjoy playing him, and I love the quick LFR queues (we queue together on him for that reason), but I really don’t like that he’s worgen… the hunchback mainly. However, I find healing quite boring, especially in LFR, which means I don’t really ever stick playing the Priest for long periods of time. I actually started levelling him during Cataclysm, just by healing dungeons. I got to about level 77 and it tailed off as I was playing my DK a lot at this time. This is when I started to become an altoholic, I was swapping characters a lot and this guy saw the worst of it I think. At the start of MoP, I was tanking on my DK and wasn’t enjoying it at all, so I swapped back to the Priest and levelled him next, my second 90. Alt Appreciation – Paladin Week! I’ve played Pally on and off, levelling one to level 30. Deleting it. Coming back a few months later, getting to level 60. Deleting it. I think it’s because I’ve never really got stuck into one, get bored really quick and give up.I played one at the start of BC, when Paladins were first allowed into the Horde. I’ve been wracking my brains to think of any opinions, but I’m just coming up with a blank. I know it was a healer BElf but that’s about it. 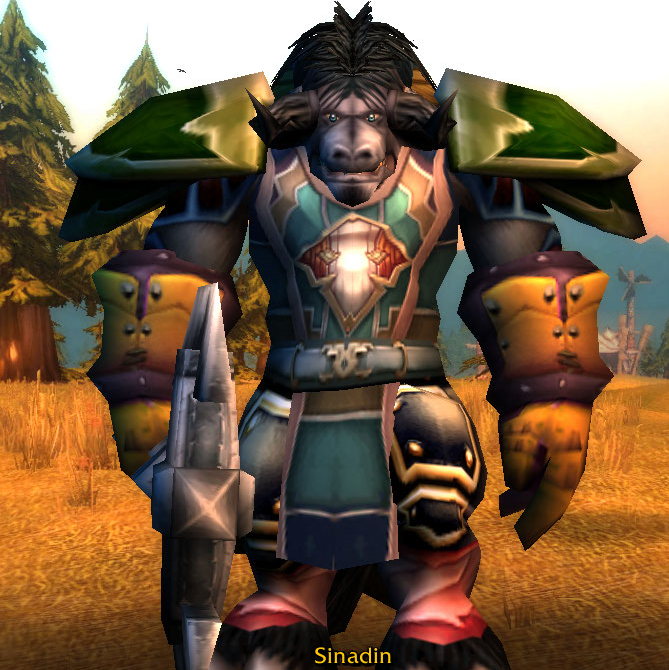 I currently have 2 Paladins: 65 Tauren called Sinadin and a level 8 whose name I can’t even remember and will be deleted shortly.On my quest to get every class to 90, I only have Paladin and Druid, neither of which I’m particularly enamoured by… which says it all really. Anyway, as a token of appreciation to possibly one of my least favourite classes, here’s a pic of that Tauren. 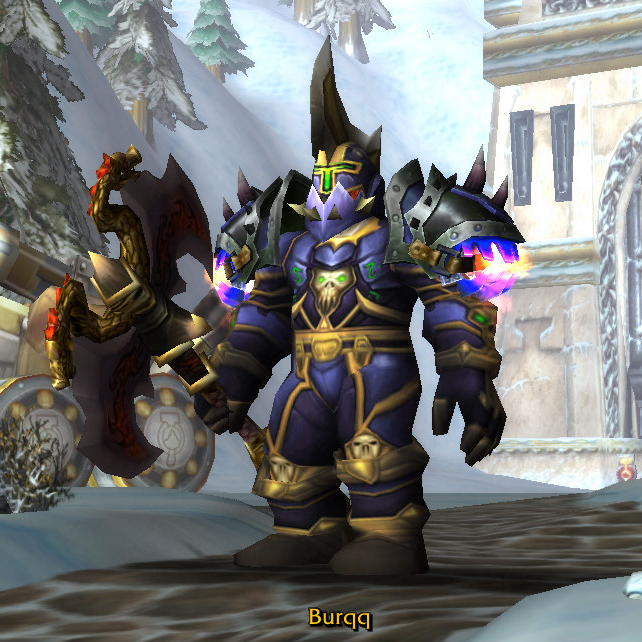 A complete contrast here, but I love my Paladin! I only recently rolled her, she has less than a day played (she’s level 51, so still a baby! ), but I’m enjoying it very much. Here she is, my only Dwarf! I haven’t really experimented with the class yet – I haven’t tried DPS spec, other than to throw a few Denounce’s around if the group is good, and I wouldn’t dream of tanking, but I enjoy using holy light and the pretty spell effects. As a healer, it seems the class has fewer spells to throw around, I generally only use about 4 at the moment. I assume this will of course change as I level up, but I remember back to my Priest and there seemed to be an awful lot of different heals all doing the same thing. Writing this post has made me really want to play her, but I promised myself I would run all ToT and SoO this week (legendary cloak quests, blergh) before I played alts. So much to do, so little time! See you next week for the Priests! Alt Appreciation – Monk Week! You’re not going to hear a lot from me this week, unfortunately. That’s my Monk. He’s 90. Has been for weeks and weeks. Find it extraordinarily boring. Why don’t you use weapons to fight? What kind of witchcraft is THAT?? Look at it… it’s not even badass. Meh. Ok well I absolutely, irrevocably, unfalteringly, ADORE my monk. LOOK HOW AWESOME SHE IS. This is Burquette, my Windwalker Monk. In the past year or so of playing, I have made sure to try as many different classes as possible, with different roles and different races. I’ve quite enjoyed some of them (especially healers for some reason), however… this toon is in a category all by herself. If I have a crappy day at work, or a bad DPS day on my main, or need a bit of revitalisation, I always come back to her. Anyway, I really enjoyed the Panda starting zone and I love the Pandaren models too. I find the Chi thing easier than the Rogue combo points to master too, and although I’m not much good at DPS, I love every minute. I really wanted to make her my main, but I play my Mage much better – probably because I know the class better – so I’m just keeping her as my main alt at the moment. I find I have pretty good survivability as well, which is definitely needed as melée playing takes a certain amount of skill and situational awareness… neither are skills that I have in abundance. Lots of pink writing today, I have the mog shown above to share with you all later in the week, so Ciao for now!